The annual Hermanus Whale Festival is an enviro-arts festival, celebrating the local art and crafts, the southern right whale, and the environment in equal measure. The event is immensely popular, now attracting about 100,000 visitors. The festival offers arts and crafts, theatre, live music, a half marathon, and surf festival in addition to some of the best shore-based whale watching opportunities in the world. Hermanus boasts the world's only traditional Whale Crier who alerts visitors to whale sightings with a kelp horn every day during whale season. Every year between July and September, the Southern Right Whales travel thousands of miles to the southern coast of South Africa to mate and calve in the bays. Hermanus is frequented by these majestic animals and the steep cliffs and numerous vantage points looking out over the bay make it the ideal spot to go whale watching in the Cape. 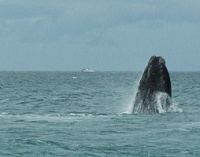 In fact, it is often lauded as the best land-based whale watching destination in the world. Hermanus is a charming coastal town even without this wonderful natural spectacle, with plenty of little cafés and restaurants, quaint shops, a very picturesque setting, and a friendly and artistic atmosphere.